My son described this as a pumpkin pie wrapped in a cinnamon roll. I think I would concur. But in any case this coffee cake is absolutely perfect for an Autumn treat. 1. To begin, preheat your oven to 325 degrees. Butter or grease a 9x13 inch cake pan, and set it aside. 2. In a bowl, whisk together 1 egg, pumpkin puree, 1/2 c sugar, a teaspoon of cinnamon, 1/4 tsp nutmeg, and about 1/16 teaspoon each of ginger and cloves.. Whisk those until smooth, and set it aside. 3. In another bowl, stir together 2 c flour, 3/4 c sugar, and a teaspoon each of baking soda and baking powder. Set that aside as well. 4. In your mixing bowl, beat together 3 eggs, 1 stick (1/2 c) room temperature butter and a teaspoon of vanilla. Beat them until smooth. 5. Mix half of the flour mixture into the butter mixture. Once it is combined, mix in a cup of sour cream. 6. Finish off with mixing in the remaining flour mixture. Combine these until jut mixed, making sure to scrape the bowl with a rubber spatula. 7. Spread half of the cake batter in the bottom of your cake pan. Then carefully spread the pumpkin mixture over the top of it. 8. Spoon the remaining cake batter over the top of the pumpkin, and gently spread it out as best you can. You may have a little pumpkin peeking through, that that is quite okay. 9. Now for the final touch. In a food processor, combine 1 c brown sugar, 1/3 c cold butter that is cut up, a teaspoon & a half of cinnamon, and half a cup of pecans. Pulse the ingredients together a few times until crumbly and combined. 10. Sprinkle this mixture over the top of the cake. 11. Bake for 50-60 minutes, or until the cake tests as done in the center with a toothpick. 12. Allow it to cool to near room temperature. 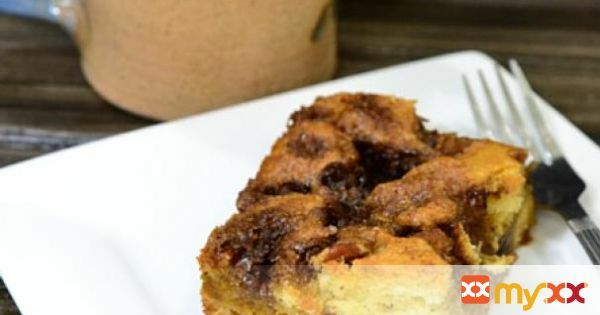 Enjoy with a cup of coffee...it is coffee cake after all! 13. Serving number dependant upon how you cut the cake.